The Weber Westerner – one of the rarest Weber grills we’ve seen. I nearly shat myself on Saturday when this ULTRA RARE GRILL appeared on eBay. Not only is this cow skulled beauty the rarest of rare – it’s also in fantastic condition. According to the Weber Timeline, the Westerner became available in 1958. This specific grill is 1962 or older. 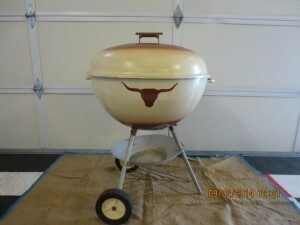 Even though this grill is MISSING its original wheels, it is already bid up to over $1500. The 26″ rotisserie is a sweet bonus – at item that until now we’ve never seen.